Cardiovascular diseases are nowadays the first cause of death and severe disability in the modern civilization. For this reason, each effort to perform new diagnosis for its treatment may have a great social and economical impact. The study of cardiovascular pathologies involves complex aspects and different fields so that the only possible approach should be interdisciplinary. Inside the cardiovascular pathologies, atherosclerosis is the most frequent disease affecting th human being. While percutaneous angioplasty and stenting technique are widely used in interventional cardiology, their success is still limited by unresolved problems such as the marked reaction of the vessel wall (neointimal hyperplasia, that, in some patients, leads to a marked reduction in lumen size a few weeks post-implantation or restenosis). Cellular proliferation is especially acute when a stent is inserted and it normally appears around the stent struts. This problem was partially solved using the so called drug eluting stent. Clinical evidences showed that its therapeutic effectiveness deeply depends on drug-release rate and spatial distribution in the tissue, mainly affected by device design, angioplasty procedure, physico-chemical properties of drug and surrounding environment, as well as local hemodynamic. Angioplastic balloon instertion is nowadays the challanging therapy for stent-induced restenosis. The object of the present project is the analysis of the effectiveness of drug-eluting intravascular devices under numerical and experimental point of view. For the aforementioned aspects, it is proposed a multidisciplinary research group composed by engineers, clinicians and veterinary surgeons. The different project phases include: Analysis of the state of the art related to the problem, knowledge and analysis of the commercial intravascular devices (stent and balloon), computational and experimental analysis, animal and numerical model of the clinical problem, device design simulation in order to analyze device effectiveness and for proposing design improvements. In particular, computational models are a powerful and useful tools and they play a very important role in the project. 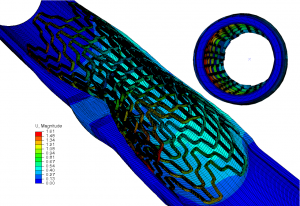 The applicant group has a strong experience in the field, demonstrating in the recent years a strong capability to develop numerical models related to the modelling of tissue behaviour, interaction between vessel and medical device, fluid-structure interaction problems, mechanobiology models such as remodelling processes or atheromatous plaque growing among others. The participation of a commercial factory of intravascular devices in the project will allow a direct possibility to transfer the knowledge to the commercial field and has to be consider as advantage for providing contiuous feed-back regarding the design of new products. Lastly, it is important to underline the importance that a multidisciplinar group composed by engineers, clinicians and veterinarians may provide. This group has been working together in other projects with considerable success and allows the possibility of treatment of all the mentioned clinical problems under each single aspects.